I wasn't really aiming to create "Medal-Like" nails. But it was late at night before my big day of Hosting Duty. I looked at my nails at exactly 12mn and my eyes grew wide --- I had to do something about my nails! I promised myself I won't go overboard with my nail art, I just needed a couple of minutes to make my nails look decent for the next day's shoot and I understood very well I had to wake up early! Apply 2 Coats of Orly Nail Lacquer in Prelude to A Kiss. Let Dry. 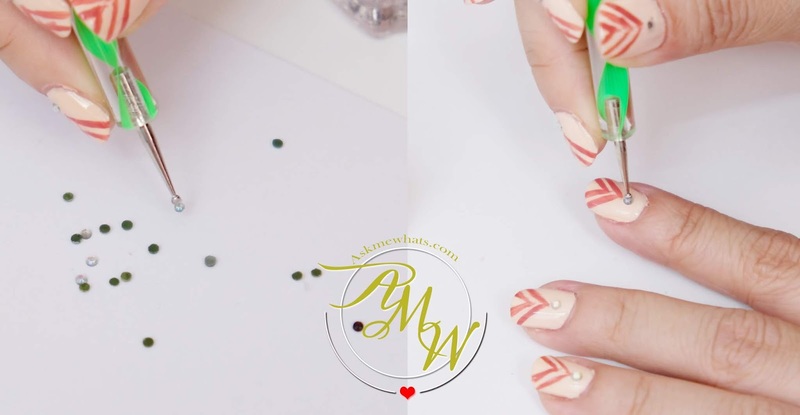 Using a thin nail art brush, apply lines (shaped like V) on each nail. I used Orly Nail Lacquer in Pink Chocolate for this. 2 V-shaped lines on each nail. Grab your rhinestones using a nail art dotting tool (a ballpen or toothpick if you don't have such tool) and press the rhinestones just below the sharp corner of V shaped lines. Secure everything with Girlstuff Fast Dry Top Coat. I made "extra" by adding 3 rhinestones on my thumbnails..because, why not? My medal-like nails which Kyle loves so much because whenever he finishes his milk, I always exclaimed: "Kyle is a Champion!" and he would look at my nails. How do you like this simple art? If you are just starting up, feel free to just add rhinestones on your regular nail polishes and it'll look even more fab!